Brianna Caitlin Hildebrand (born August 14, 1996) is an American actress. 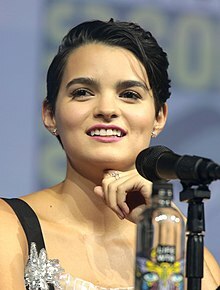 She is known for appearing in the web series Annie Undocumented, and as Negasonic Teenage Warhead in the films Deadpool (2016) and Deadpool 2 (2018). Hildebrand appeared in the web series Annie Undocumented, named best web series at the 2014 New York TV Festival. The series was created by Daniel Hsia, Elaine Low and Brian Yang. Hildebrand was cast as the superhero Negasonic Teenage Warhead in the film Deadpool on March 30, 2015. The film was shot in Vancouver in April 2015, and released on February 12, 2016. She was also cast as Sasha in First Girl I Loved, starring opposite Dylan Gelula and Mateo Arias. In July 2017, Hildebrand was added to the main cast for season two of The Exorcist. Hildebrand graduated from A&M Consolidated High School in College Station, Texas. Regarding her sexuality, Hildebrand has said, "I learned pretty early on that I like both boys and girls". But later on in the article she admits that she was still unsure about her sexuality but eventually came to terms that she only liked girls. "I am lucky to say now that it is not frightening for me living in LA to be gay. Even when I was in Texas, I wasn’t afraid. I was kind of out in high school. I just could never decide on what label. I am glad that I am public about it and I think I should be." ^ "Brianna Caitlin Hildebrand - Ancestry.com". ^ Brown, Emma (December 7, 2015). "The Marvel Badass". Interview. Brant Publications, Inc. Retrieved February 7, 2016. ^ a b Kit, Borys (March 30, 2015). "'Deadpool' Casts Newcomer as Negasonic Teenage Warhead (Exclusive)". The Hollywood Reporter. Retrieved March 31, 2015. ^ "New York Television Festival Announces 2014 Winners". Deadline Hollywood. October 25, 2014. Retrieved March 31, 2015. ^ Perry, Spencer (March 30, 2015). "Newcomer Brianna Hildebrand Joins Deadpool as Negasonic Teenage Warhead". ComingSoon.net. Retrieved March 31, 2015. ^ Chavez, Paul (April 13, 2015). "Ryan Reynolds gets face-to-face with Deadpool co-star Brianna Hildebrand who plays Negasonic Teenage Warhead in the film". Daily Mail. Retrieved June 28, 2015. ^ Zerbib, Kathy (July 28, 2015). "New 'Deadpool' Images Reveal Ryan Reynolds Unmasked, Brianna Hildebrand as Negasonic Teenage Warhead (Photos)". TheWrap. Retrieved September 13, 2015. ^ Andreeva, Nellie (July 12, 2017). "'The Exorcist' Adds 'Deadpool's Brianna Hildebrand As Season 2 Series Regular". Retrieved September 14, 2017. ^ Geoffrey Macnab (March 9, 2017). "Brianna Hildebrand on Deadpool, new teen lesbian drama First Girl I Loved and coming out as gay: 'It wasn't planned, I just met my girlfriend on set'". Retrieved May 26, 2018. ^ MIKE VULPO (May 24, 2016). "Teen Choice Awards 2016 Nominations Announced". EOnline!. Retrieved September 14, 2017. This page was last edited on 25 March 2019, at 21:59 (UTC).